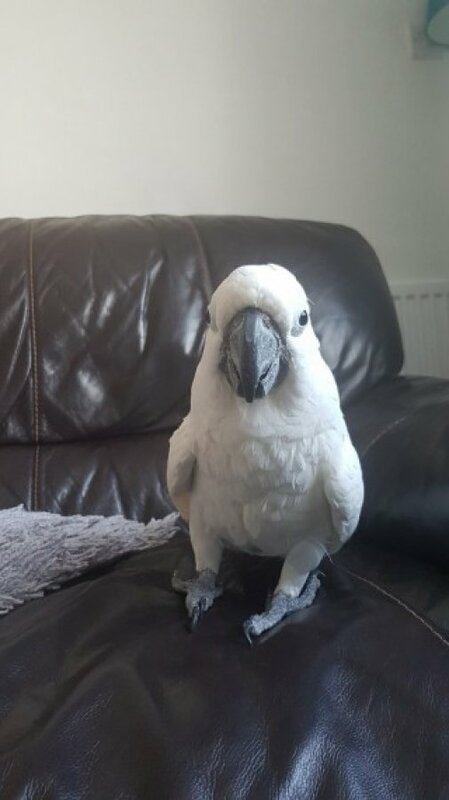 It is with great sadness that we have to search for a loving home for our umbrella cockatoo. He is 10 years old and silly tame. He loves attention or to snuggle into your chest and whisper in your ear. He loves to preen your hair and ears. He is very talkative and easily picks up new words or sounds. He will happily entertain himself In his cage as long as he has toys or paper to play with. He loves a warm shower. He LOVES sunflower seeds which comes in handy for training sessions. He comes with his cage and toys. He is a lovely bird and prefers busy homes or someone who has time to give hime lots of cuddles. he has previously lived with dogs and can even bark like a dog. We are willing to accept near offers for him to the right home.